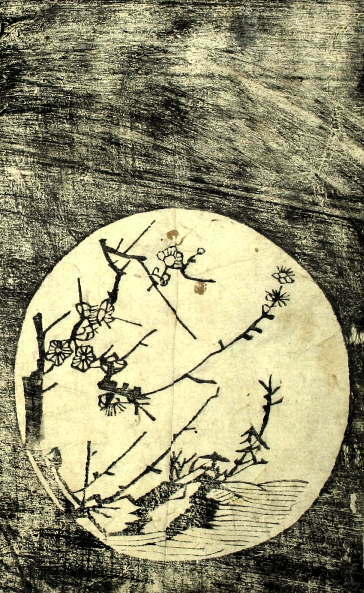 Another popular song via Kurata, this one from the 1920s and entitled Sendō kouta 船頭小歌 ("Song of the boatman"), with lyrics by NOGUCHI Ujō 野口雨情, music by NAKAYAMA Shimpei 中山晋平. I've translated it into a blues form as an act of ethnocentric violence which uproots the text from the language and culture that gave it life. Shortly after the earthquake [of 1923] [this song] came to be regarded as having foretold the destruction of Tokyo, predicting that the blossoming metropolis would be turned into a wilderness covered by plume grass [the "reeds" in my version]. Spreading among the shaken people, the allusive lyrics of the song persuaded so many that this song eventually became recorded as "the modern outbreak" of the foretelling songs. Before the recent great earthquake and fire in which so many men and women died, a song beginning "I'm a bunch of withered reeds on a dry riverbed..." became popular, with even children joining in the singing, and particularly popular in Kōtō, both sung and whistled. This song's lyrics and melody alike were pathetic and miserable, enough to fill one with loathing. It began as a song in a movie, and so it was certainly not intended as a prophecy of the recent tragedy or anything like that, but now that the great earthquake and fire have occurred, and so many have indeed become like withered reeds on a dry riverbed [...] people have stopped singing the song entirely; still, it is unpleasant to recall. These lyrics, Tsuji said [...] would be fine if you gave the child these gifts when they woke. But if you did not, you would have tricked the child into sleeping, and what kind of adult would a child habitually deceived by their mother grow up to be? In short, the lyrics would "damage their moral character." Remarks like this afford us considerable insight into the educational ideology of the Meiji period. The more you read about the Meiji government's clumsy, knitting-with-cabers attempts at social engineering via musical education, the more you understand the success of the dōyō 童謡 movement: (relatively) non-goody-goody, non-lame songs for children, and no governmental interference. Because the government that is big enough to give you a pinwheel and a flute when you wake up is also big enough to take it away and make you obey instead. Speaking of danna, here's a great anecdote from 1876 that I read in KURATA Yoshihiro 倉田喜弘's "Hayariuta" no kōkogaku 「はやり歌」の考古学 ("The archaeology of popular song"). So, it's the Shimpūren Rebellion. ŌTAGURO Tomoo 太田黒伴雄 and his band of two hundred-odd mutinous, barbarian-expelling ex-samurai have launched their surprise attack on the Kumamoto garrison, leaving hundreds of casualties. They've also invaded the official residences of and critically wounded prefectural governor YASUOKA Ryōsuke and garrison commander TANEDA Masaaki 種田政明. What made this telegram so great? Well, writers like KANAGAKI Robun 仮名垣魯文 praised it as a model of the kind of clarity and precision that telegraphy demands. More importantly, though, it's made up of two sentences of seven mora each, which means that all you have to do is add a 7-5 ending to make it into a dodoitsu. And that's just what people did: two good examples from Kurata's book are "And what have you been up to?" (soko de omae wa/ dō shita ka) and "Now, where can the money be?" (kane no arika wa/ doko ni aro). For a while it seems that publishing lists of these was a bit of a craze. Summary: There's no tragedy that the media won't exploit if it helps them fill out the morning edition. Via languagehat, I learned of the World Loanword Database (WOLD). As the comments at the 'hat indicate, there may be room for discussion re the data (e.g. a bunch of proto-Malayo-Polynesian is in the donor list for Japanese — Ōno Susumu lives! ), but there's still plenty to enjoy there. For example, the word danna 旦那, "husband, master, patron." The immediate source of danna is Chinese tánnà 檀那. Chinese in turn borrowed it from Pali, where it was dāna दान and apparently meant "giving" or "generosity" in general — but, in the context of the Buddhism via which China imported it, the key meaning was alms. 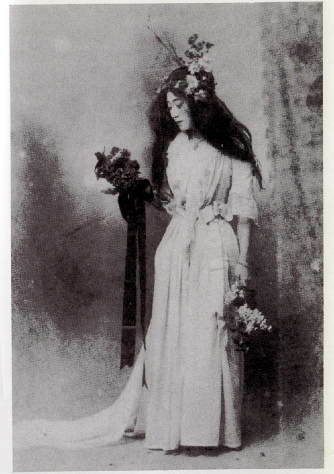 Here, again courtesy of Japan's Shakespeare Century 日本のシェイクスピア１００年, is a picture of international geisha of mystery Sadayakko as "Orie" (おりゑ, corresponding to Ophelia) in the first Japanese production of Hamlet ever, which was produced in 1903 by her husband KAWAKAMI Otojirō's avant-garde theater company. Kawakami's company had already produced Othello and The Merchant of Venice in 1903 before finally getting around to Hamlet ; they were not time-wasters. On the other hand, NIKI Hisae characterizes their work as "sensational and melodramatic" and Kawakami himself as "a showman, who could not recognize the artistic value of the play." Ouch. I haven't read any Kawakami-company scripts, but I have heard that, for example, the soliloquies were cut — even "to be or not to be" — so it seems fair to conclude that sensation and melodrama were prioritized over psychological portraiture. Kawakami also tended to modernize and localize the content of the plays: thus, Hamlet became a story set in contemporary Japan about Hamura and Orie instead of Hamlet and Ophelia. Such shenanigans allowed TSUBOUCHI Shōyō to take the credit for the first modern performance of Shakespeare for his Bungei Kyōkai production of Hamlet later in the decade. What scholars mean by "modern" here is that it was a more or less faithful and complete translation, with no cut soliloquies (and absolutely no jōruri), plus the use of female actors for female parts — although, paradoxically, Shakespeare didn't do this (and Kawakami did). Anyway, almost a century later, professor UEDA Kuniyoshi 上田邦義 took Sōseki's idea and ran with it. The result: Noh Hamlet [PDF]. According to Ueda's website, his tragedography also includes Noh Cleopatra and even Noh Murder in the Cathedral (insert "Who's on First" homage here). Be sure to check out his archives for performance videos. Horatio: I am Horatio, who served Hamlet, the Prince of Denmark. After his death, following his will, I have been travelling abroad to recount his tragic tale. Even now I deeply regret that, as he felt ill at ease about his heart when he was challenged to a fencing match by Laertes, I could not stop him from accepting it, and he lost his life. So long have I been absent from Denmark that I am now returning home to pay a visit to Hamlet’s as well as Ophelia’s grave. As I have hurried, I have already arrived at Ophelia’s grave. I will sit still and pray for her spirit. Here in Northern Europe, spring has finally come. Blowing in the breeze, the violets, primroses, and buttercups are so lovely and wild that they remind me of Ophelia while she was alive. At her funeral, the queen offered flowers, saying, "Sweets to the sweet. Farewell. " It was here at this very spot. I dearly remember Hamlet saying to me as his dying words: "If thou didst ever hold me in thy heart, / Absent thee from felicity awhile, / And in this harsh world draw thy breath in pain, / To tell my story." Chorus: All people’s happiness and longevity, we pray. Chorus: Speak your mind, do what you say, and do not fight. There is a divinity that shapes our ends, rough hew them how we will. Chorus: The rest is silence. Now cracks a noble heart. Good night, sweet prince. And flights of angels sing thee to thy rest; flights of angels sing thee to thy rest. Just noticed this at the Kindai Digital Library site: a page linking to parodies of Sōseki's I Am a Cat . From the top, you got I Am a Rat , I Am a Flea (an anti-how-to for raising fleas, with a supplement on how wives should behave: drinking and naturalist novels are right out), I Am a Kitten , and best of all, I Am a Frock Coat . You know you're in for some wide-ranging satire when you go from Darwin to the Russo-Japanese war in the first six pages. TSUBOUCHI Shōyō's 1884 translation of Julius Caesar is notable for two things: (1) being the first ever translation of a full Shakespeare play into Japanese, and (2) being rendered jōruri-style, right down to the title: Shiizaru kidan: Jiyū no tachi, nagori no kireaji 該撒奇談 自由太刀餘波鋭鋒, that is "The Curious Tale of Caesar: The Swords of Freedom, and the Keenness of their Wake." And greeuously hath Caesar answer'd it. Come I to speake in Caesars Funerall. The style is flowery and repetitive, which is to say jōruric, but the content is fairly close to the original — it's not even really worth back-translating. The main difference is the localized moral and philosophical references: for example, just before the "evil that men do lives after them" part, Shōyō inserts a Japanese proverb of similar import: Kōji mon wo idezu, akuji sen ri ni hashiru ("A good deed doesn't leave the house, a bad deed runs a thousand miles"; cf Twain's "A lie can travel halfway around the world while the truth is putting on its shoes"). Similarly, Antony's famous "honorable man" becomes a Confucian "至正至公の君子" or "正義の君子", that is, "righteous and just gentleman [jūnzǐ]." Caes Et Tu Brute? - Then fall Caesar. "But, Lord Caesar..." Casca says — "Bah!" replies Caesar, "Your prating is—" — As he turns, he frustrates the first dagger-thrust — His shoulder, grazed, lets flow a crimson tide of blood — "What is this?!" Caesar cries in shock, and twists to gain the upper hand, and Casca for his part feels pain invade his arm, and cries for help — The rest in grim agreement draw free hidden daggers from their sleeves — Now left and right and fore and flank, they strike as one, death whispers in the dark beneath the moon — Struggling under lightning-flashing blades — Kicking, Trampling — Fighting for his life, Caesar is become a raging lion — Well, now! here's the incident in the capitol, a rising to bring the lofty low, as a great mountain crumbles before raging waves — Marcus Brutus, who was watching all, runs up to Caesar, pushes dagger-point deep into Caesar's side — "Et tu, Brute?" — So Caesar speaks his final words — He pulls his cloak over his head, the better twenty wounds and more to bear — And so, amid the statues standing many in their rows, rolls the man to rest before the pedestal where Pompey stands, and there he breathes his last.